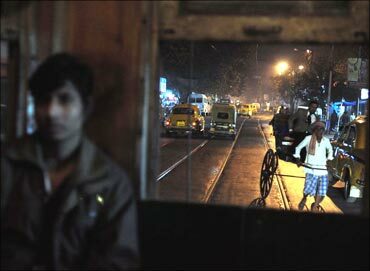 It was quarter to nine on a cold December evening at the Kalighat tram depot in south Kolkata. A row of tramcars stood like ghosts under an iron shed. At the corner of one coach an elderly man clad in khakis read the newspaper in the dim light of a 40-watt bulb. A few people asked him about the next tram to Tollygunge and left in an instant when told they would have to wait for 30 minutes. Except for a frail 70-year-old who pottered around, as buses, autorickshaws and cars breezed past, and a little boy who resisted attempts of his parents to drag him away, there was hardly anyone there. 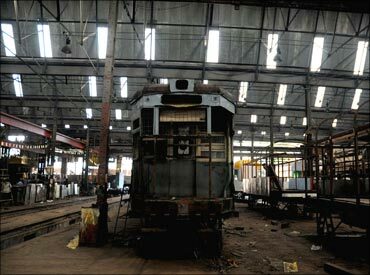 Five years ago, Kalighat depot used to be one of the busiest in Kolkata. Trams would ply on three routes covering about 16 km. Now a lone tramcar rattles along the 3-km track between Kalighat and Tollygunge. Seven years ago this car -- like all other Kolkata trams -- ran on lines embedded in large grass patches reserved for trams. 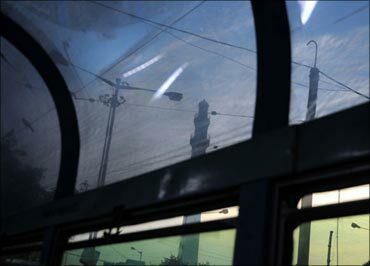 Image: The lone traveller on an evening tram is the conductor himself with the proverbial monkey cap on. These patches were ripped away in 2004 to make space for cars and buses. Trams now run in the middle of the road and passengers have to get past speeding traffic to catch a tram. "Why would people want to risk their life to catch a tram?" asked Manik Ghosh. An employee of the state-run Calcutta Tramways Company for more than 30 years, Ghosh said trams between Kalighat and Tollygunge now barely have 10 to 15 people even during peak hours -- when a single car can accommodate over 150. Despite repeated requests from tram workers, the lines were not realigned to the sides of roads, which would have allowed more passengers to board. Image: Once the lifeline of public transport, 32 km of tram tracks are now either closed down or temporarily suspended. 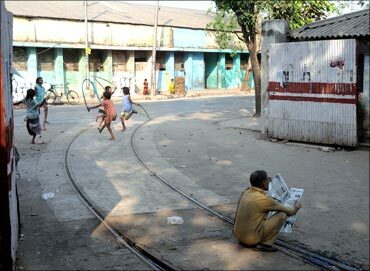 The result: within four years of de-reservation of grass patches, earnings from sale of tram tickets dipped by 42 per cent, according to the West Bengal Statistical Handbook, 2008. The Calcutta Tramways Company began in 1880 with horses hauling tramcars on Calcutta's -- as the city was then known -- serpentine streets. By 1905, the system was powered with electricity and by 1943 the network covered 67 km. 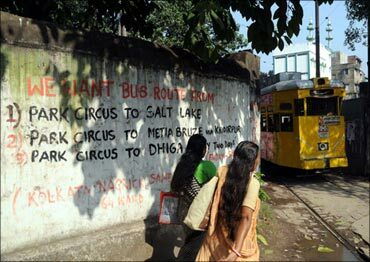 In 1967, the West Bengal government took over Tramways Company marking the beginning of four decades of neglect. Image: While all major European and south East Asian cities revived their tram networks based on sound economic logic, Kolkata overlooked its advantages. Since the takeover only 10 km of track length were added to the network, while more than 32 km were either closed or shut 'temporarily' for construction work. "Temporary' is a euphemism for shutting down for good," said Debashish Bhattacharya. A scientist at the Indian Institute of Chemical Biology, Bhattacharya loved discovering Kolkata on its tram network during his student days in the late 1970s and early 1980s. But the scientist's love for trams is not just nostalgia. The Calcutta Tramways Company advertisement depicting tram as 'a slow moving electrical reptile adding to the romance and old-world charm of this city' angers him. "A tram's service life is 60-70 years compared to five-seven years for a bus. It does not pollute, navigates narrow streets with ease and accommodates 150 passengers. With a dedicated corridor, trams move much faster than other fuel guzzlers and boast of an enviable track record on passenger safety" he said, adding that major European and south East Asian cities have revived their tram networks in the form of Light Rail Transit. Image: With zero investments in modernization, trams still run on 40s technology while fuel guzzlers choke city roads. 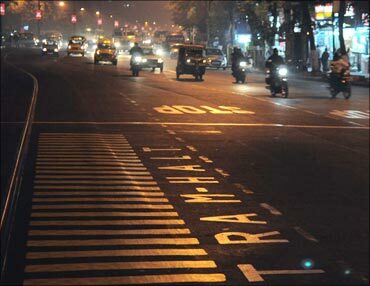 Bhattacharya has taken cudgels over the 'temporary' shutdown of the tramline near the Ballygunge railway station. In 2004, the West Bengal government suspended traffic on the line for constructing a flyover. According to Bhattacharya, the line was a conduit between the railway station and rest of Kolkata. 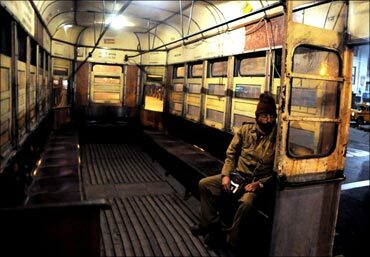 He estimates that Tramways Company lost between Rs 60,000 and Rs 70,000 per day as a result of the shutdown. Tram traffic did not resume after construction was completed in 2006. Bhattacharya filed an RTI application asking for information about reopening. "But that fell on deaf years, no one in the management had any answers to my query," the scientist said. Till the early 1990s, trams used to cater to a variety of passengers. The first car at 4.40 a.m. was a fixture for those catching an early morning train at the Howrah station. Image: Long queues for tramways run buses at the esplanade terminus. A little later, the pious would crowd trams for a bath in the holy Ganges. Then came schoolchildren escorted by doting mothers. Later in the day lawyers and babus would rough it out on crowded trams to reach the office-hub at Dalhousie Square. Trams were the lifeline before autorickshaws, buses and metro became the priority. Kolkata's metro rail project struck the first major blow to the city's trams. A 12-km stretch connecting south Kolkata to the heart of the city was 'temporarily' shut in 1980. The route never reopened. In the 1990s, Tramways introduced bus services and many saw it as a precursor to an end of tramways. 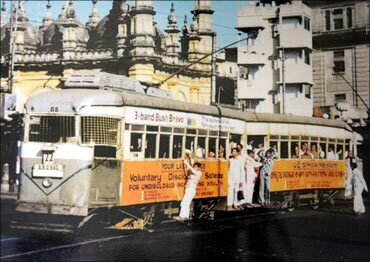 "Trams would die a natural death," the then transport minister Shyamal Chakravarti announced at a public rally in 1992. To reduce public dependence on trams, the West Bengal government did away with volume-based rationalisation: the practice of more trams during peak hours was stopped. 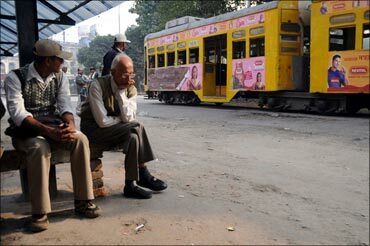 Image: A senior citizen tram waiting for renovation at Nonapukur workshop. 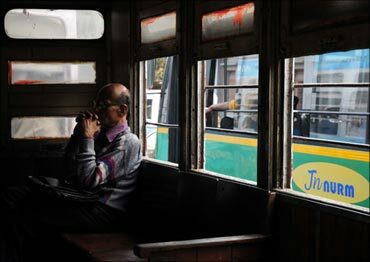 According to data gathered from the Calcutta Tramways Company's website and West Bengal Statistical Handbook, 2008, the number of commuters came down from 0.75 million per day in the early 1980s to a dismal 77,500 in 2008 -- a decline of more than 10 times in a period when the city's population increased by 67 per cent. "Timetables are not maintained, conductors and drivers are not recruited for trams anymore. There is not even a toilet for the employees at the Esplanade terminus," lamented Ghosh who is now posted at the terminus. Actually the Esplanade terminus is a vast open toilet with commuters relieving themselves at different corners. Situated at the heart of the city, the terminus still has a busy look about it. One can see long winding queues, but for buses run by the tram company. Image: A tram moves across the Dalhousie square. A 'watering car' which once roamed the entire network at nights cleaning tracks with water now rusts at a corner of the terminus, one of its compartments now a gossip room for idlers. In 1992, Tramway Corporation introduced a bus service, ostensibly to increase revenues, but ended up with additional operating losses of Rs 10 crore (Rs 100 million) every year. The corporation's initial fleet of 40 has gone up to nearly 400, while the number of trams decreased from 476 in early 1980s to 211. Of these, only 90-odd cars run regularly. Debasis De, a trade union leader with Tramways, said, "Before the government takeover, Tramway Company used to be self-sufficient, but now its yearly subsidy amounts to Rs 150 crore (Rs 1.50 billion)." Most of the 90-odd trams run on the 1940s technology. Swarup Kumar Pal, Tramway Company's chief operating manager confirmed modernisation has been limited to the tram superstructure. Image: The once wooden bodies were converted into steel ones, and recently into the new look transparent polycarbonate body. "We once thought of importing new trams but the idea was abandoned because we had no funds. Recently, though, the cars have got a transparent polycarbonate body," Pal said. But the new look -- at a cost of Rs 14 lakh (Rs 1.4 million) per tram -- has not found much favour among commuters. The coaches now draw in a lot of heat and commuters find the ride uncomfortable, especially during Kolkata's sweltering summer. When told, a senior official of Tramways Company joked, "But the passengers do get to see the stars at night." 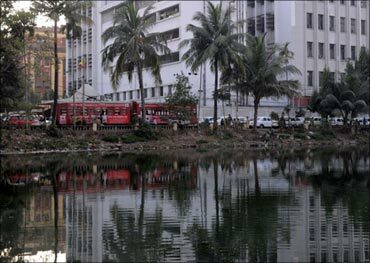 The last capital infusion for the tramways came from the World Bank-sponsored Calcutta Urban Transport Project in 1982. With a Rs 108 crore (Rs 1.08 billion) assistance, 200 trams were purchased and 10 km of tracks added to the existing network. As funding dried up, so did the interest in reviving the tramways. The metro rail project gobbled 7 km of tram tracks in the 1980s and is all set to render three tram depots and another 25 km of tracks defunct in 2011. Image: A tram moves through the narrow lanes of central Kolkata. Sitangshu Sekhar Ghosh, the works manager at Nonapukur Workshop where trams -- some almost 70 years old -- are brought for repair, rues the government's neglect. Straining his voice above the clink-clank of metal, he said, "It is wrong to say trams are slow. In the few dedicated grass patches even a 50-year-old tram runs at a speed of 40 km per hour, while the average speed of vehicular traffic in Kolkata is 12 km per hour." The works manager does not mince words when talking of the metro: "The 22-km metro was constructed at a cost of over Rs 1,800 crore (Rs 18 billion). Construction has started on metro corridor, a portion of which will run underwater across the Ganga. The projected cost of the 14.7 km track is more than Rs 4,000 crore (Rs 40 billion). The 60-odd km tram network could have been modernised at a fraction of that cost." Those who seek heritage in the tramways need not be worried: luxury-trams are well preserved to take winter-tourists on a seven-hour joy ride around the city. The working-class people, though, jostle for space in buses. Image: An archival photograph from 1997. Till the early 1990s trams used to cater to an array of passengers. Trams run on the 1940s technology; no modernisation in the past 70 years except changes in the exteriors. Last capital infusion of Rs 108 crore in 1980. Less than half the available number of trams, 211, are on road. In 1980, 400 trams were on road. 17 km of tram tracks de-reserved; trams lose their right of way over other traffic. 20 km of tracks closed down, 12 km temporarily suspended, never to reopen. Many of these are commercially profitable routes. With de-reserved tracks passengers unable to cross speeding traffic and board trams plying on the middle of the road. Tracks closed down for construction of flyovers and metro rail. No volume-based timing; irregular service shifts passengers to buses, autos and metro. Losses pile up. Image: A tram halt in the middle of the road after dedicated tracks were uprooted. With passengers unable to board, revenues have dipped by half. Average speed of 40 km/hr in reserved tracks compared to 12-14 km/ hr for vehicular traffic. Trams can run up to 72 km/hr. Long service life, low maintenance costs, hence low fares. Passenger carrying capacity per unit of road space more than that of other vehicles. Best suited to cities with narrow roads. Unbeatable record of passenger safety and comfort. Infrastructure costs of expansion 20 times less than metro rail. Image: A lazy afternoon at Galif Street terminus. The super tram or light rail transit (LRT) is a cheaper variant of heavy rail or metro systems. After the Second World War, tram systems were dismantled in many countries as automobiles gained popularity. Later, faced with staggering traffic jams and financial and environmental costs of fuel, tram systems were revived in the form of light rail. LRT can be street-level or elevated and with or without exclusive right of way. Typically, at up to 100 km/hr they are much faster but occupy no more road space than trams. Most LRTs are designed 'low floor' to make boarding easier for commuters and accessible to the disabled. In Asia, Hong Kong, China, the Philippines and South Korea revived their tram systems in the form of LRT by 1990. Electric trams, operating in Budapest, Hungary, are the busiest in Europe with a 60 seconds frequency during rush hour. Eastern Europe maintained its tram networks even after the Second World War. New networks have been built in the region since the late 1990s. Light rail around the world has achieved a 20-40 per cent modal shift from private cars, thus decongesting crowded cities. Right now, as many as 364 tram and light rail systems are running, 32 are under construction and 24 planned in over 70 countries around the world. 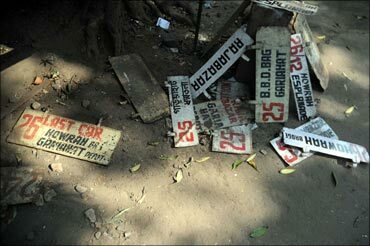 Image: Route-boards scattered at the Gariahat tram depot.